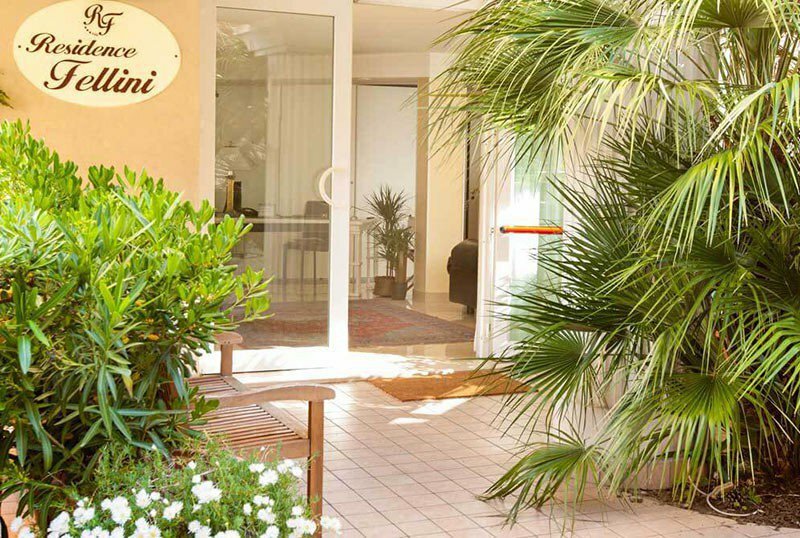 Residence Fellini is a 3-star superior hotel in Rimini managed by the owners and located in the heart of Marina Centro. Ideal for holidays with children and for business trips, it is open all year round and has apartments that can accommodate up to 6 people, free WI-FI, parking spaces and free parking. Accept animals of all sizes. The residence is located in Marina Centro, the tourist heart of Rimini, in a quiet location and close to the promenade with shops, restaurants and clubs. The beach is less than a 5-minute walk away, while the old town and the Palacongressi are around a 20-minute walk away. One-room, two-room and three-room apartments are available. All are equipped with air conditioning, WI-FI and possibility to use the parking space. They have a private bathroom with a shower and a hairdryer, a kitchenette with a microwave, a four-burner stove, a 220l fridge, crockery and crockery. MONOLOCALE ARIMINUM: ideal for 1 or 2 people, has a width of 24 sqm and is composed of a living room with a double sofa bed, a bathroom, a 22 "TV and a furnished balcony. BILOCALE GRADISCA: it measures 25 square meters and can accommodate 2 people and 1 cot. It has a living room with a sofa, a 22 "TV, a double bedroom, a bathroom and 2 equipped balconies. DOLCEVITA TWO-ROOM APARTMENT: it has a width of 27 sqm, can accommodate 3 or 4 people and consists of a bathroom, a double bedroom, a living room with a sofa bed, a 22 "TV and 2 equipped balconies. AMARCORD APARTMENT: it measures 31 square meters and is ideal for 4 people. It has a living room with a double sofa bed, a double bedroom, a bathroom, a 32 "TV and 2 equipped balconies. BILOCALE FELLINI: in its 46 square meters can accommodate 4 or 5 people. It consists of a living room with a double sofa bed, a double bedroom, a 32 "LED TV and 2 equipped balconies. TRILOCALE ROMA: measures 70 square meters and is suitable for up to 6 people. It consists of an Ariminum studio and a Fellini one bedroom apartment, so it has a double living room with a sofa bed, 3 bathrooms, 2 22 "and 32" TVs and 3 equipped balconies. Garden, terrace, lift, free bicycles, lobby with TV, bar, indoor games room, laundry with coin-operated washing machine and dryer. PARKING: uncovered and available to all customers. The hotel has a second parking space, always free, 300 m from the property. SERVICES FOR DISABLED: entrance on the ground floor, lift for disabled people, rooms with wheelchair maneuvering space, bathroom with shower accessible. PETS: pets of all sizes are admitted and can also access the beah affiliated with the hotel. In the residence: outdoor playground area in the garden, dedicated interior space, strollers. In the apartment: cots, seats at the table. Baby sitter and pediatrician are available upon request for a fee. At the beach: live entertainment, nursery and playground. The hotel has an agreement with the Bagno Nicoletta bathing establishment n. 36, which in addition to basic services such as sunbeds, beach umbrella and cabins, offers sports fields (beach tennis, beach volleyball, soccer, bowls), ping-pong tables, playground, nursery with changing table, entertainment, baby sitter and theme parties with pyrotechnic shows and gifts. The beach allows access to dogs. At the Fellini residence all children up to 3 years can take advantage of the camping beds for free. At Fellini, Residence in Rimini near the sea, book your beach holidays in advance! In fact, if you do by April 1, 2019 you are entitled to a special and advantageous 10% discount on the regular rates for a 2-week stay and 5% for a one-week stay during the summer. But hurry up, certain occasions are not forever!